I’m of two minds whether I should cover this product. On the one hand, it would be fantastic for use on a particularly scenic stretch of road, or a trip through a safari park. On the other hand, if used indiscriminately and unedited, it could lead to the world’s worst home movies. Not yours or mine of course, but I’m betting you know people who must not be allowed to get their hands on one. What is it? 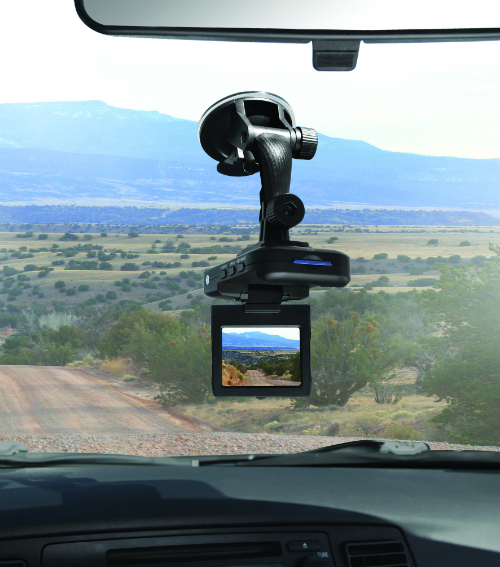 A video recorder that attaches to your window or dash using a suction cup mount. It takes colour video in AVI format at a resolution of 640 x 480. It comes with a 2 GB SD card but will support a 32 GB card that will allow you to record three hours of video (the battery will only last for two hours—I’m assuming you can leave it plugged in to your car charger, however). The camera comes with 8X zoom, a 120 degree viewing angle and a motion detector so it will record when the car is in motion. It also comes with infrared LEDs so it can record at night. Note that it also records audio. The description doesn’t indicate if that function can be shut off, but you should be able to strip out unwanted noise (screaming kids, etc.) with most video editing software. It does photographs as well. Sound interesting? You can find it at Hammacher Schlemmer, where it sells for $129.95. Is Subaru Canada’s Top Rally Car?